Chinese tech isn’t an imitation of its American counterpart. It’s a completely different universe. Made in China Stickers at Huaqiangbei Electronics Market, Shenzhen. These stickers are still affixed to items by hand. 山寨 (Shanzhai) translated directly means mountain stronghold, and that’s where my journey appropriately begins. I’m in a small town in Guizhou, one of the poorest provinces in China, where the GDP per capita is the lowest in the country. But the lack of disposable income does not prevent the glimmer of aspirational consumerism from fueling this live sales seminar that I am overhearing. In a large conference room, within a hotel that is more often used by couples looking for privacy from families than tourists, a man drones on about filial piety. His story is melodramatic and suspenseful at all the right parts, about a mother who gives up her last penny to save her son’s company. He asks: in return, what can sons and daughters do for their parents who have given them so much? Even I am close to tears when the man does his big reveal: buy them 2,500 RMB silk bedding. I go on to visit other mountain strongholds — villages and zhais, places where bathrooms still offer an adrenaline rush of potentially falling into a pit, and pigs are slaughtered alongside a river. A combination of tourism and economic development are rendering these places increasingly rare. Yet one element remains constant: the ubiquity of mobile phones and the central importance of phones for the simple transactions of everyday life. Most transactions center around one app: WeChat. WeChat is an app made by Tencent that has become crucial to life in China, especially with Tencent’s state-sponsored initiative of 智慧生活 (zhihuishenghuo, smart living). WeChat enables access to messaging, video chat, payment systems, and public services. And it has nearly one billion users — about as many users as Facebook Messenger. In fact, many of WeChat’s features have recently been eerily appearing in Facebook Messenger. I use WeChat to message a friend while standing in the middle of a rice paddy, to pay for snacks and water in a remote village, to buy train tickets, to book hotel rooms, to order taxis, to get takeout, and to send my aunt photos. If I wanted to, I could also use it to pay electricity bills, top up my mobile phone account, make hospital appointments, and check the weather. Scan these QR codes to pay, even at the village bodegas. WeChat pay on the left, Alipay on the right. Everywhere I go, little “Alipay/WeChat Pay” QR codes sit in plastic placards, in the most unexpected places. In one small town, every business, including the woman making 炒粉 (chaofen, rice noodles) in the front of her house accepts WeChat Pay. At a newly opened train station, massage chairs have no slots for coins or money—just a simple QR code pasted on their arm. To pay with WeChat, I scan the QR code with my phone, and the chair turns on. "Have you Taobao-ed today?" says a sign in a village government hall, Shandong Province. 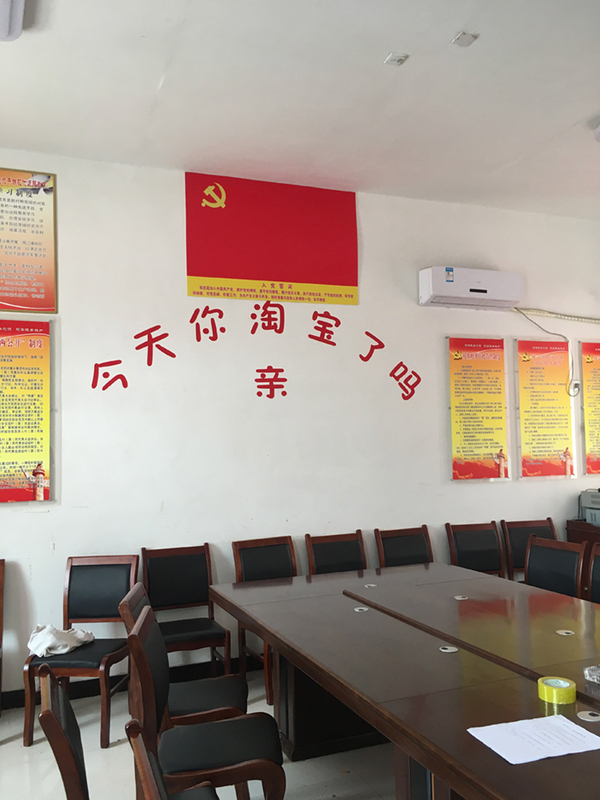 In another village, I use my phone to note down a mysterious, recurring banner I see for “农村淘宝, cun.taobao.com,” which has been plastered across a storefront as well as across small electric bikes that can nimbly carry cargo up steep mountain slopes. Taobao is an e-commerce site owned by the Alibaba group, with 570 million monthly active users as of 2016—more than the population of the US. It’s only later on, in the city, that I realize what the cun.taobao.com signs mean. The trip back to the city feels as magical as the landscape. I’m awed by the quickness of infrastructural development. The high-speed train bolts past small villages and foggy mountain valleys, over bridges and into miles of tunnels. What used to be an eight-hour drive from Guiyang to Guangzhou is cut down to a mere four hours. In a country where almost half the population still lives in the countryside, it would be irresponsible to discuss technology without acknowledging the stratifications between the urban and the rural, and what transformations as well as hybrids the tensions between the urban and the rural create. Driving through my family’s neighborhood in Guangzhou, my aunt points out the urban villages to me — pockets of leftover settlements surrounded by the skyscrapers of the Central Business District (CBD). Free-floating, these places are libertarian islands in the city, where village mayors can still sell their land to developers in an act of self-eradication, ridding the skyline of themselves and their diminutive buildings forever. Guangzhou’s neighbor, Shenzhen, is also full of urban villages. Like any storied place, Shenzhen has a poetic origin story. As I stand in the Shenzhen Open Innovation Lab (SZ OIL) with my friend and collaborator Maya, we listen to the SZ OIL’s founder, David Li, tell us the history of Shenzhen. Outside the Sino-Finnish Design Park where SZ OIL is located. Shenzhen is a city built on exceptions. David explains that when the Chinese government decided to experiment with capitalism in the 1980s, it didn’t want to expose existing major cities like Beijing or Shanghai to the risk of failure. Instead, the government chose Shenzhen, a tiny cluster of fishing villages, even building up a wall in some parts to demarcate the boundary between socialism and capitalism. Since the beginnings of the experiment, Shenzhen has exhibited all kinds of hockey-stick-shaped growth that people in Silicon Valley talk about in hushed tones of exaltation. The population has skyrocketed from 30,000 to almost 12 million, the cost of living has gone up, innovation is surging, and the time it takes to create, design, or build a new product decreases day by day. 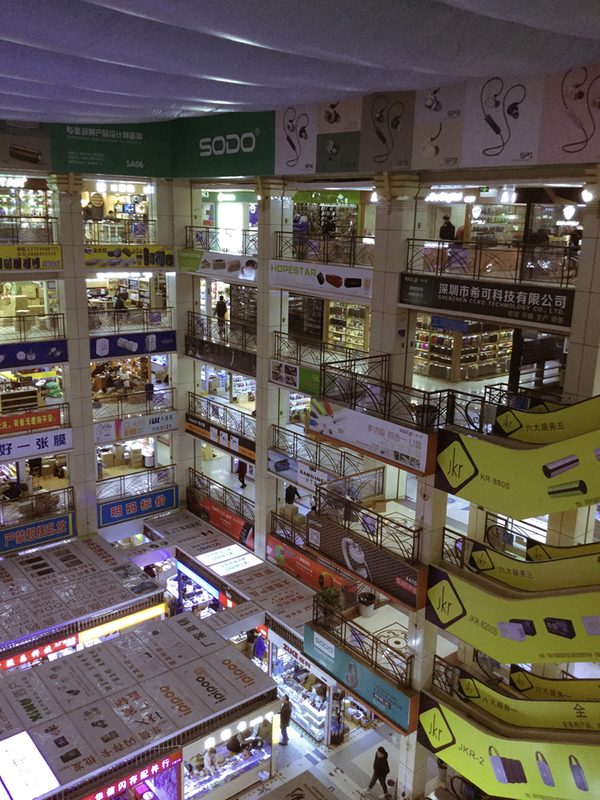 One part of Huaqiangbei's market, selling packaged electronic goods. 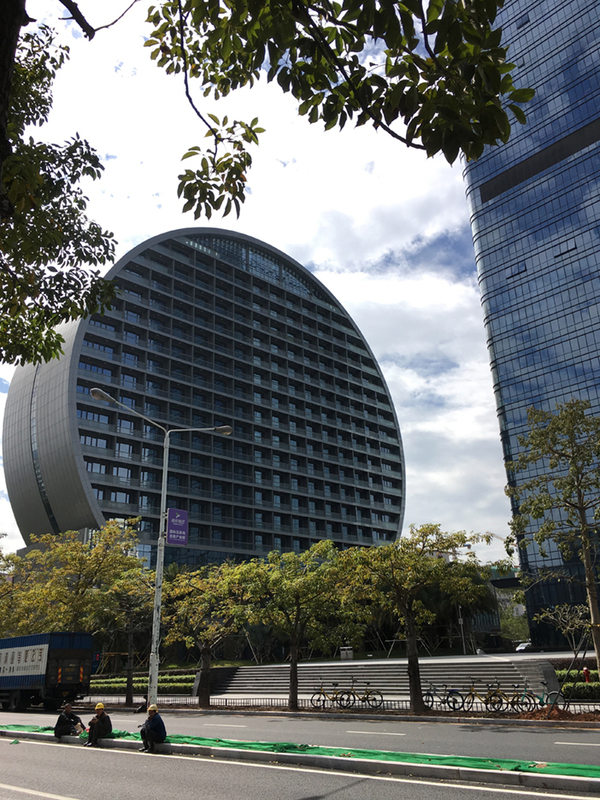 David gives us a tour of Huaqiangbei, the electronics city in Shenzhen that spans several blocks and is written about extensively in the Wall Street Journal and Wired. Inside, tiny booths that are six by six feet wide are packed to the brim with objects. These booths sell everything from mobile phone parts to SD cards to fidget spinners, headphones and wireless chargers. Behind each of these tiny booths is the power of a full factory, and a company that makes several million RMBs a year. Many of these items are “white-labeled” technology, and some of the factories behind the stalls are Original Equipment Manufacturers (OEMs). White-labeled technology comes in many forms, from software to the electronics sold at Huaqiangbei that end up being branded and sold as AmazonBasics headphones, LG DVD players, or even HTC phones. If the default design you see at the market doesn’t suit your brand, you can easily get an item’s design tweaked. For all the Instagram ads and Kickstarter campaigns about a new kind of headphones or a faster wireless charger, many of those items come from Huaqiangbei, where the objects are repackaged from their original white-labeled condition and given a marketing gloss. Outside of the market, there’s conveniently an entire street devoted to freight shipping, where companies can help you ship your product anywhere in the world, and offer advice on dodging import/export taxes. Before we leave the Huaqiangbei market, David gives us some research advice. The way people use technology tends to be the same in cities, he says, but the real story is in the countryside. While using ApplePay in San Francisco is similar to paying with WeChat in Shanghai, the scale of technology’s pervasiveness is more apparent in rural China than the rural US. For example, imagine paying for a long-distance bus ticket or a coffee from the local diner in Cheyenne with a cell phone. There are still parts of the rural US without cell phone service, places where you feel untracked and like you might disappear. Yet even in one of the poorest provinces in China, QR codes will follow you from towns to villages. David points to Taobao villages, 淘宝村, as an example of how far tech companies in China are willing to go to expand their user base. Taobao villages are a concerted effort by Alibaba to bring e-commerce into the countryside, where Taobao provides the infrastructure and training for villagers to sell their goods online. The other end of that ecosystem is 农村淘宝 (rural Taobao), where even the most remote villages can buy cotton bedding and new shoes at their local 服务站 (help station), and the end-to-end logistics are taken care of by Taobao. This also fuels a whole new economy of aspiring small business owners in villages, who buy in bulk online to build small stores and supermarkets, rather than peddling their wares in informal markets. In 2017, the writer Ning Ken coined the term 超幻 (chaohuan) to describe the collision between fantasy and fact in China. When talking about technology in China, it’s easy to make parallels to the US. The more interesting parallels lie between reality and science fiction. When I get back to San Francisco, I joke with people that I have not traveled in China — I have time-traveled. Shenzhen to Guangzhou takes a mere thirty minutes on the high-speed train that runs at 186 miles per hour. Through the turnstiles, a passport reader scans your ID and ticket, displaying your face on a screen. A green box appears, using facial recognition to signal that you are allowed to pass. Workers trying to troubleshoot an automated car garage in Shenzhen. You can retrieve your car using facial recognition. Runs on Windows. My face is just another set of measurements in a database, somewhere. How secure that database is, I don’t know. How secure my payment information in WeChat is, I don’t know either. It has become unfashionable to talk about censorship and surveillance in many intelligentsia circles in China, especially in comparative contexts between China and the US. It is difficult to have broad conversations about privacy and security policies when so much of the grand technological experiment in China is still unfolding. And at the heart of it always hums the question, just how cultural is the construction of technology? 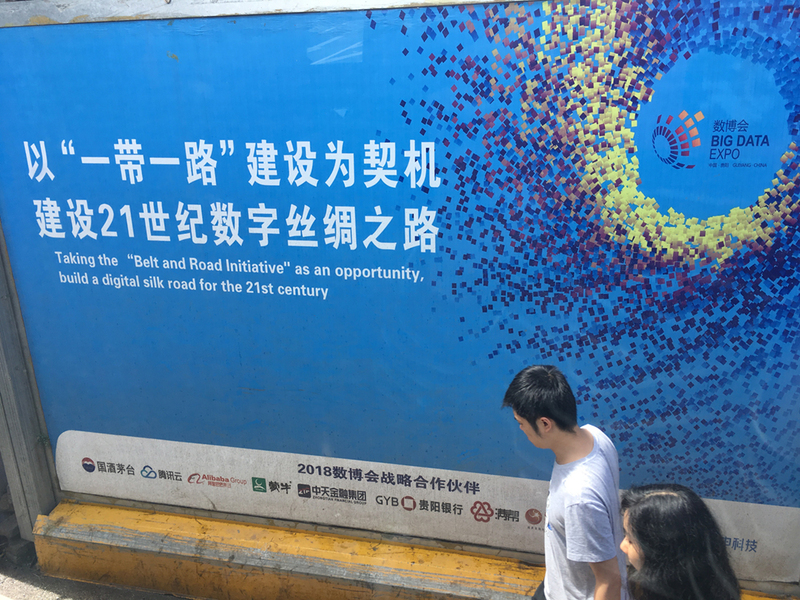 As many scholars such as Joe Karaganis, Jinying Li, and Lucy Montgomery have asked, how can piracy help expand media and technological access in China? Why is creative reuse and the lack of intellectual property protections in Shenzhen seen as knock-off culture by many in the US, when the actual conditions are more like open-source? How does the vibrant economy in southern China challenge Western notions of authorship and copyright? Is technology less universal than we think? Huaqiangbei photos by Ian B. Pearce. All other photos by Xiaowei R. Wang. Xiaowei R. Wang is a hacker, thinker, and designer in the San Francisco Bay Area. She is the creative director of Logic.